its that time again where my book haul comes out. i take a terrible photograph. and fangirl about how i much i love what i got in the post. want to see what i received this week?.. ASDFGHJKL THIS BOOK!! Ruby, *pats head*, THANK YOU SO MUCH FOR FANGIRLING OVER THIS SO MUCH THAT I GOT IT. Really. The writing? PERFECT. The Characters? I WANT BLUE HAIR OKAY?! Just...read it! Oh and isn't the cover georgeous? THIS BOOK WAS AWESOME. BASICALLY. AND ANOTHER COVER THAT I STROKED AND PETTED. I think this book haul should be dubbed 'the pretty cover edition'. What do you think? The illustrations in this made me so jealous. I like to call myself an ok artist but these..GAH. Oh and can i just say how awesome it is that Jodi Picoult's daughter co-wrote this with her?! ......I liked this cover too....;p I liked the concept of the book, but.....you know this guys BUT I HATE SWEARING IN BOOKS. Period. Not read this yet but I am really intrigued, it looks good, and it's nice and thin - not that i have anything against long books! I LOVE them, but i think it should be a nice quick but interesting read. We'll see! Now i hardly ever read paranormal books. They're just not my thing. BUT, I've heard so much about Holly Black I had to say yes to this one, i've not read it yet, but, i can tell you this - judging from the cover and the blurb - I WON'T be reading this before bed...it sounds creepy! So that's what i got this week, not *much* compared to my usual hauls but I recieved some pretty good books so i don't mind! Although it does feel so odd not to get anything in the post.....over the last few weeks i've had at least one package a day! *Thank you to Orion, Curious Fox, Egmont UK and Hodder and Stoughton for these pretties! BETWEEN THE LINES HAS THE MOST BEAUTIFUL COVER I HAVE EVER SEEN. 'NUFF SAID. OMG.. Those books are gorgeous... I WANT RED ROCK! I've really good feedback on it! AHHH I KNOW! *drools* So have i so i'm really excited to read it! OMG YOU'VE READ IT AND OMG IT IS AMAZING AND OMG I CAN'T STOP SAYING OMG! OMG YES I DID AND OMG I HAVE THE NEXT ONE AND OMG AREN'T THE COVERS SO PRETTY?!!! AND YES IT IS SOOOOOOOOOOOOOOO AWESOME AND THANK YOU FOR ALL YOUR FANGIRLING AND YES. ARGH YOU GOT SO MANY AWESOME BOOKS. 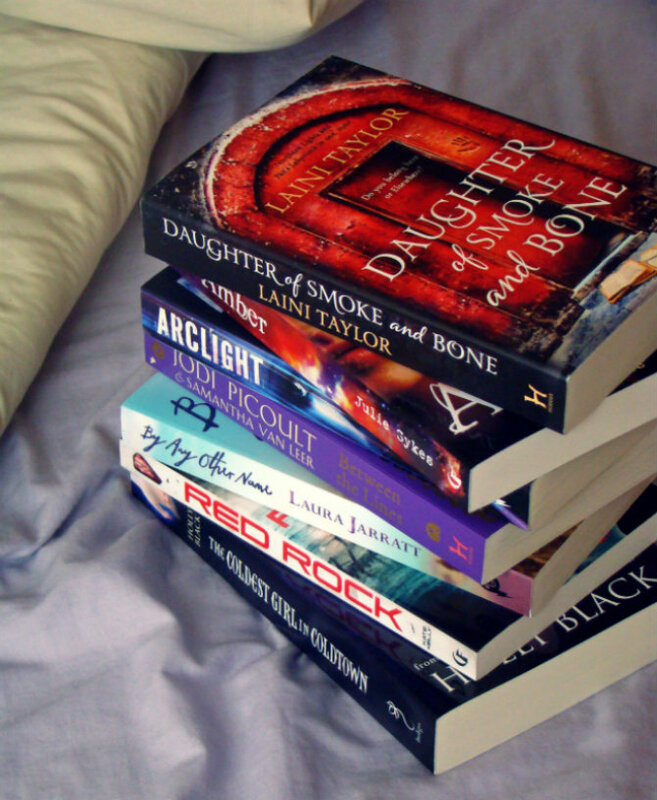 I need to read Daughter of Smoke and Bone, I just discovered they have a copy at my library *happy dance*. Happy Reading! AAHHH I KNOW! AND YAYAYAYAYYYAYAYAYAY GO BORROW IT BEFORE SOMEONE ELSE DOES!! YES I DO!!! Awwh no and oops. thanks for pointing that out! Oh and thank you SO much for the lovely comment you left on my blog a month ago. I was on a blog hiatus, and did not see the comment until today. It totally made my night. I actually designed my blog myself! I'm so glad you like it. Totally following you now! Daughter of Smoke and Bone is EPIC.